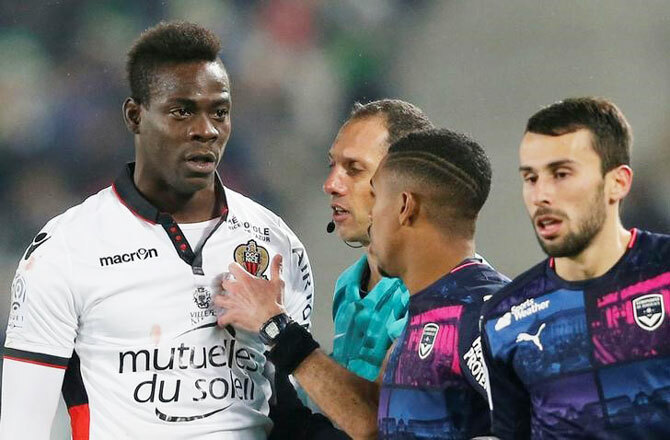 Mario Balotelli has been banned for two games after being sent off near the end of Nice's 0-0 draw with Girondins de Bordeaux on December 21, Ligue 1's disciplinary said on Thursday. The 26-year-old was shown a straight red card for kicking Bordeaux defender Igor Lewczuk. The Italian international will miss the Ligue 1 leaders' games against Lorient on Sunday and Metz on January 15. Nice coach Lucien Favre was handed a suspended two-match ban for his behaviour towards match officials following the game against Bordeaux.